LONDON (Reuters) — Furious companies facing weeks more uncertainty over an ever closer Brexit lashed out at politicians on Wednesday, and warned of chaos at ports and catastrophic job losses if Britain failed to secure a withdrawal deal with the European Union. British lawmakers rejected on Tuesday a Brexit agreement that would have secured tariff-free trade and safeguarded the just-in-time cross-border supply chains on which many manufacturers and retailers depend, risking the country's disorderly departure from the bloc on March 29. Companies ranging from Channel Tunnel operator Eurotunnel to Scotch whisky distillers were unanimous in calling for urgent and decisive action by the British government and warning of the consequences of a no-deal Brexit. "The distortions would be too great for trade, financing conditions and investor confidence," said Deutsche Bank Chief Executive Christian Sewing at an event in Berlin, predicting a disorderly Brexit would plunge Britain into recession for at least two years and lop a half percentage point off economic output for the remainder of the EU. The imposition of customs checks on every truck crossing the English Channel could lead to tailbacks stretching 130 kilometres from London to the port of Dover, Jens Bjorn Andersen, the head of Danish freight company DSV warned. The port handles 17 per cent of the United Kingdom's goods trade. Up to 10,000 trucks a day pass through with everything from perishable food to medicines. In case of problems at Dover, logistics giant Deutsche Post said it had opened an office in the English port of Southampton and had 450 customs specialists advising clients. It has spent 12 months planning for a no-deal Brexit, but without any clarity on Britain's next steps cannot put any of those plans in place, it said. "We are relying on a decision by the United Kingdom," said Deutsche Post, which employs 54,000 people in Britain. Germany's chemical and pharmaceutical industry association (VCI) called for interim solutions to avoid a chaotic Brexit, in particular measures to ensure the supply of medicines. "A disorderly Brexit would create such a complex situation that it is impossible for companies to prepare for all eventualities," said VCI managing director Utz Tillmann. Belgium's finance minister warned Belgian companies on Wednesday to step up their plans for Brexit, with figures showing only one in five are ready for the customs arrangements that could apply for trade with Britain. LTO Nederland, which represents Dutch farmers and agricultural producers who export goods worth more than 8 billion euros (C$12 billion) annually, said unhindered trade was crucial. Its members were discussing with customers and partners how best to prepare and "spread the pain over the chain." It urged the Dutch government to offer practical solutions. "Whether it be manufacturing, agriculture or services, across the piste we rely on trade. We don't have a massive domestic economy. The reason a no-deal Brexit is so scary is because tariffs on everything are highly punitive under WTO (World Trade Organization) rules," said Andrew Jackson, head of fixed income at fund manager Hermes Investment Management. John Allan, president of the Confederation of British Industry and chairman of supermarket group Tesco, told BBC Radio that those thinking they could ditch the free trade agreements Britain has with the EU and renegotiate from scratch were living in "cloud cuckoo land." Looking at the wider British economy, Swiss ground services and cargo handling business Swissport Group warned a disorderly Brexit could further tighten the U.K. labour market. The pressure has ramped up since the 2016 referendum, with fewer EU candidates entering the U.K. job market. Executive vice-president EMEA Luzius Wirth said some airports were already experiencing a workforce shortage, driving up labor costs by as much as 10 per cent in parts of the country, with workers able to negotiate higher salaries. 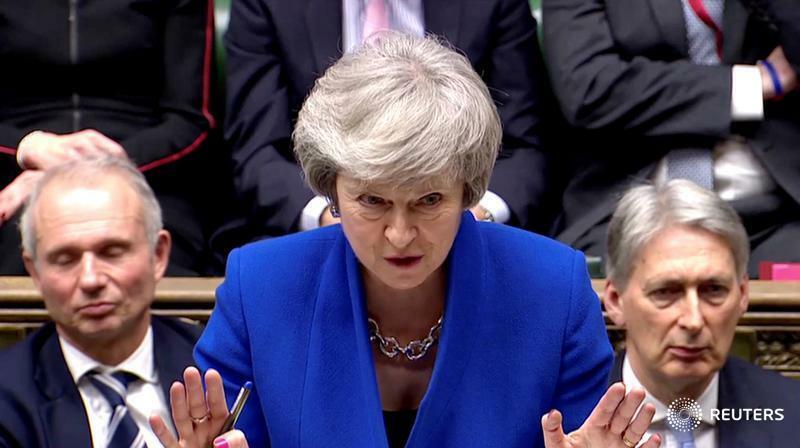 British Prime Minister Theresa May must now speak to senior parliamentarians to find a compromise that would avoid a no-deal Brexit or consider another referendum on EU membership. The opposition Labour party's finance minister-in-waiting, John McDonnell, said May could eventually get a deal through parliament if she negotiated a compromise with his party. Share prices were spared heavy losses on Wednesday as analysts said the risks of further deadlock were already priced in. Some UK bank stocks even gained slightly, suggesting optimism for a parliamentary compromise over Brexit, according to some investors including David Roberts, co-manager on the Liontrust Strategic Bond fund. "Global investors now believe the chances of a 'hard' economically damaging Brexit have receded ... There is still a long way to go, but hopes of a mutually beneficial solution are growing," he said.